Have you ever encountered the message "Enter the password to unlock your iPhone backup file" when you are trying to restore the backup file to your new iPhone? Or after restoring iPhone 4s to factory default, and need to restore backup file, but then you forgot password to unlock iphone backup file? This can be a huge trouble if youforgot iPhone backup password. Because you are unable to restore precious data including address books, messages, call history, email account settings, etc. in the backup file. That really makes one frustrated. However, take it easy! It is not the end of the world. There is way to unlock iPhone backup password. Generally, you are not capable of decrypting the backup file unless you restore the iPhone as a new and resync everything you synced. But you will lose SMS, application, address books, etc. in it. 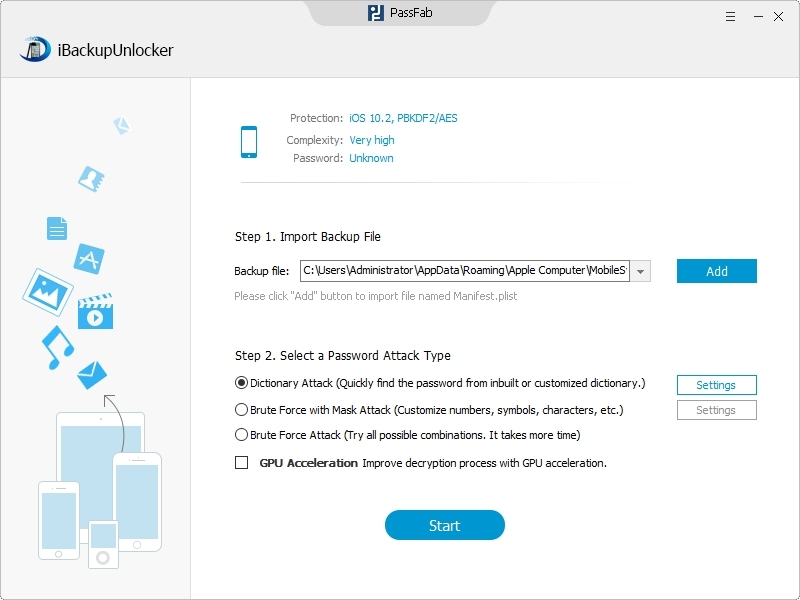 Fortunately, iPhone Backup Unlocker, a professional iPhone backup unlock tool, can help you solve that issue. It can easily decrypt iTunes backup file password and let you get access to your vital data again. This program works friendly with red iPhone 7, iPhone SE, iPhone 6s, iPhone 6, iPhone 6 Plus, iPhone 5S, iPhone 5, iPhone 4S, iPhone 4, iPad and iPod holding three powerful password encryption modes: Brute-force Attack, Brute-force with Mask Attack and Directory Attack. You can choose any of them according to your requirements to find out your password. The following tutorial tells you how to find out password to unlock iPhone backup file. To unlock iPhone backup password, download this password unlock tool and install it on your Windows PC. Launch the program. In the main interface, click "Open" to import your password protected backup file. There are three types of attack for you to choose. You can choose the most appropriate one according to your issue and set the parameters of each attack mode. Brute-force Attack: This mode will try all character combinations one by one. It takes longer. Brute-force with Mask Attack: You are recommended to use this mode if you can remember some symbols of the password for it will help you save a lot of time. Dictionary Attack: If you are lucky to have the habit of record password. You can import the password list directly from your default dictionary and screen out the password. The whole process will take you few minutes. And the speed depends on what attack mode you choose. Once finished cracking, you can see the password displayed in the box. 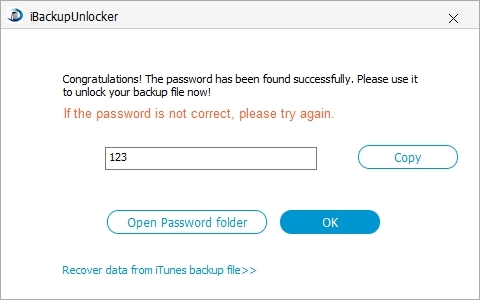 Click "Copy" button or paste the password to the password protected backup file and now you can enter password to unlock iphone backup password. Everything was done! Isn't it thrilling? Now, enjoy your iPhone again!